For what they are, they are reasonable proposals. 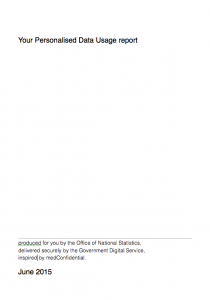 Nothing earth shattering, but it’s useful that a party has written it down, and is a slightly different approach to the labour digital government review. They propose to attempt to increase the confidence that the public should have in those who handle their data. A noble aim, and a good outcome, but like most libdem promises, it’s going to be broken. The public have a lower trust in institutional handling of data than they do in the institutions themselves. Telling the public that they can now trust more isn’t going to reassure many people into the long term. These proposals do little to add confidence from individual knowledge into the discussion. While the public registers are welcome, and they serve to show everyone where some data has gone, when there is a problem, and there will be many, it provides no reassurance at an individual level. Without that reassurance, the data trust deficit will remain, and public confidence and perceived public confidence won’t actually change. Which was the point of doing it in the first place.